BB Thomaz is the music industries newest best kept secret! Growing up in Germany was anything but happy. Being called the N Word by her step fathers, not allowed out of her room, told she couldn’t sing, her life was worthless and she should end it only fueled BB’s determination to leave home at the age of sixteen and make it on her own. This powerhouse is Germany’s recent import to the United States and she is crossing the border with a ferociously vibrant sound that crosses genres as she delivers a Pop, soul, Alternative style all her own. The “Deutschland” singer, songwriter, producer, is a self taught musician who plays the piano, and guitar with a Masters Degree in Musicology. Packing a sultry yet powerful voice some would say she has a voice reminiscent of Beyonce and a vocal range close to that of Mariah, her talent goes far beyond her vocals & beauty. Although this beauty started her career as a model for recognizable brands that include Adidas, Reebok, Nike, and Play Station her passion for music is insatiable and undeniable. Fully embracing her artistry and truly a “Force du jour” an artist on the rise already making her mark in the industry she penned and produced the theme song “For My Life” for the feature film “Landscaper” starring “Keith David”. Her Singles Fighter & Serenity which are available on Itunes will be featured on VH1’s Love & Hip Hop, her song “Waiting For” topped Beat Ports Deep House charts at number #5. BB Thomaz boasts accolades that include her being the recipient of Germany’s Rock/Pop Awards in 2009/2010. She was asked to lend her vocals to The Little Mermaid III movie soundtrack. Upon returning to the states after her successful “Street Live Tour” in Germany, Hungary, Spain, Malta, Switzerland, & Italy, she is fast becoming a household name and a favorite among her peers, co-writing with the late Grammy nominated songwriter/producer Kyle K2 Stewart II (Tamar Braxton, Fantasia, Fifth Harmony) on her new single “Don’t Go Missing” As well as creating a buzz for her performances at BET Music Matters at SOB’s,The Standard East Village, Toshi’s Living Room, Rockwood Music Hall, 2015 Circle Of Sisters, interviewed and featured in several magazines and on Arise Entertainment 360 TV. BB is currently working with producer DSharp and Grammy winning singer/songwriter Corey Jackson-Carter finishing up work on her EP which is set for release in 2016, her songs have infectious deep lyrics that take the listener on a musical journey of systematic strength and enduring empowerment of healing. Fighting her way to the top, her warm, friendly charm and spirit blows away everyone who meets her. 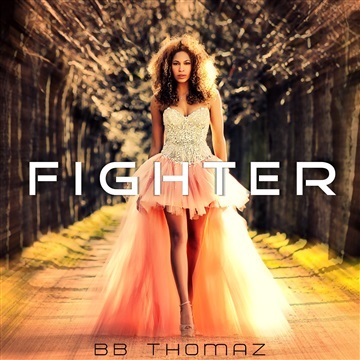 This rising star’s debut single “Fighter” available on itunes describes everything that she is.